The spirits of “Asia” announce “we’ve emerged / with our murmurs” carrying their stories into the public address of the poem. …you can’t escape history – whatever you do, history informs and shapes you and your concept. Maybe to some degree you can push something somewhere, because all of our brains are unique structures of nature you can’t even play a lick like somebody else did, even if you’re expert at copying somebody what you’re doing is different by the nature of your brain chemistry. So all that’s to say that you can’t escape history because it presses down and weighs on you, the whole history of the universe, and it is also – I don’t want to say it’s moving forward because it’s not going anywhere, it just IS – but it is now. Widely engaging, Whit Griffin confronts history as if a parlor trick turned serious. His poems offer counsel which surprises and confounds, conjuring disparate items of new and old lore at will. Griffin mixes together a celestial grab bag of cross cultural myth and magic presenting a head spinning engagement with what’s more or less generally recognizable as occulted literature. The structural supports he relies upon in terms of content are at once both factual and imagined. 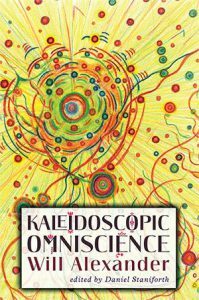 This poetry both is and is not a guide to esoteric knowledge. In Matthew Shipp’s words, “it’s not going anywhere, it just IS – but it is now.” Griffin reaches out to grab anything and everything speaking to the moment of the poem. He relentlessly spins the wheel of reference, plucking off correspondences as needed in an inspired bit of poetic magicking. Collaging together lines heavy with symbolic imagery, Griffin tests intuition against imagination. 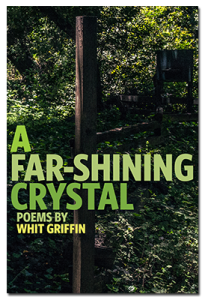 Under Griffin’s care the affair of writing poems turns into an alchemical sleight of hand. The poems are listening to themselves go, line-by-line propelling a state of constant revelation yet refusing to reveal anything. Every set of lines are rungs of a ladder which lead only to further rungs. There’s plenty here for readers, along with the poet, to disappear into again and again. A revisiting ritual gets enacted on every page. Peel back one layer and you find yourself peeling it off again a few pages later. turned Andromeda into a dromedary. Tamberlane’s tent turned from white to red. is the provider of all good things. The poem rolls on as one reference folds into the next, in the process unfolding one meaning in order to form another. Each line sparking off the one previous, springing a new set of thoughts reaching yet further afield as the poem runs down the page. Later this same poem tells us “There are seven amulets known / to all seafarers.” Continuing on to mention many specific stones: jade, coral, sapphire, turquoise, malachite, crystal, and the relations of stone-like objects: “Every tree trunk becomes a gnomon. Lost a gnomon, / gained a swearing hole.” The mark left by way of a protruding absence. There’s then a turn towards listing incredible what-if occasions, such as “To stroll with William Blake himself, and hear him speak / of the icelike Yuccas.” Before ending, “When he died his skull became the sky.” Matter of fact truth laid bare, plain as day. 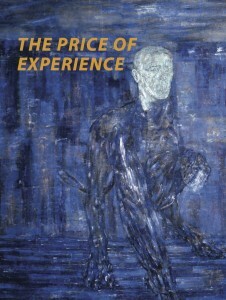 The Price of Experience is a broad sampling of Eshleman’s prodigious output in a variety of literary forms: poems, letters, interviews, book reviews, essays on contemporary art, and lectures on ice age cave art, are all brought into the mix alongside various memoir bits and notes on his numerous translation as well as editorial projects. 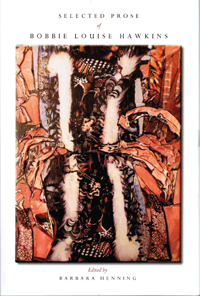 (Eshleman indispensably translates the poetry of both César Vallejo and Aimé Césaire, among others. He also edited the seminal journals Caterpillar and Sulfur.) This would be considered an “Eshleman Reader” if only somewhat incredibly it didn’t follow on the heels of Black Widow Press’ previously published The Grindstone of Rapport: A Clayton Eshleman Reader (forty years of poetry, prose, and translations). 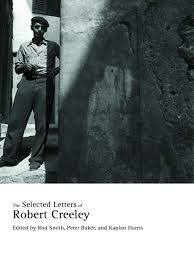 Meanwhile, it also looks forward to their publication of Penetralia (a fifty-seven-year poetry retrospective) in 2015. It’s daunting (and perversely thrilling) to imagine what the page count for the upcoming “retrospective” might turn out to be as the other two books come in at around 500 pages each. In essence, given this epigraph, which ends “It is an easy thing to rejoice in the tents of prosperity / Thus could I sing & thus rejoice, but it is not so with me!” Eshleman seeks to frame this retrospective accounting of his work in a fashion which demonstrates how thoroughly his writing arises quite literally from struggles surrounding the circumstances in which he’s lived. There should be no doubting that Eshleman has done his fair share of downward scraping into the barrel of experience, bottomless as it may be. He has always returned to his work positioning his imagination via writing in the hands of forces over which he often feels no control. The resulting discoveries astound him as much as anybody else. In fact, they sometimes astound him quite a bit more than they likely do anybody else. The limits of Eshleman’s writing arise when his impulse for self-expression overrides and self-indulgence swells within him, his proclivity for excess then gets the better of him. One case in point: while detailing his relationship with poet Paul Blackburn, Eshleman describes how his own personal demands tore him away from composing a poem for Blackburn’s second wedding and instead turned him towards writing a massive poem—as yet unpublished in its entirety—full of his working through deeply personal psychological material from out his own past. Paul was the first person to make me aware to what extent my creative blocks had to do with a swelling up of unassimilated childhood material, and of the extent to which participating in a full present life had to do with working through such material. In 1963 he married his second wife, Sara Golden, and spontaneously I started to write a poem celebrating their marriage. As I worked away on it, the problems in my own first marriage tore through the fabric, so I set the Blackburn poem aside and tried to concentrate on my own difficulties, into which churned so much material from the past that before I knew it I was working on a poem that attempted to bring my past life to bear on all that had happened to me since I had started writing poetry and come to Kyoto. This still unpublished four hundred page poem, “The Tsuruginomiya Regeneration,” was used as a quarry for some of the sections in Coils, published by Black Sparrow Press in 1973. Joanne Kyger periodically taught in the now defunct Poetics Program at New College of California, much as she still teaches now and then at Naropa. Over a decade ago I had the pleasure of being a student in one of those classes. We officially focused on “the serial poem” reading books by Jack Spicer, Ed Dorn, Alice Notley, and Ed Sanders, but more vitally the class was an uncompromising lesson in the wider practice of living—with poetry happening to be our focus—one among many of life’s daily occurrences. 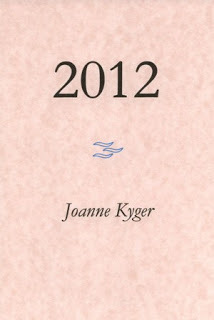 A serial poem in its own right, 2012 exemplifies how fluidly Kyger’s writing practice is a sustained fact of her life. 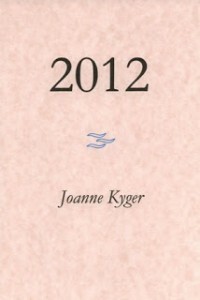 This journal-like suite of nine poems, presented in chronological order with dates of composition, is well representative of her ongoing engagement with the world via poetry over the last half-century. The writing is finely sculpted if often deceptive in giving off a carefree it’s-all-no-big-deal vibe. Of course, the simultaneous action of these characteristics only contributes towards how totally great the poems actually are. Reading Kyger’s work is to take part in sharing her daily intimacy concerning wildlife, gossip, books read, current events, past memories, friendships, and more, all balanced by her keen awareness of detail. Observation is her abiding practice and discipline. Who’s that and what’s it doing? Some animals don’t want to move. in a two mile radius. One evening when Velma and I were kids and were playing in the half dark of the front porch it started to look as if there was some big fire in the far distance. The sky glowed red and the glow became larger until it took up half the sky in that direction. And in the wake of the colour rose an enormous full orange moon. Texas full moons have the gift of being seen the instant they surface. Stand in a perfect half circle. The far line of the horizon is exactly horizontal. That line extends as far as you can see, left or right. Below that line is one colour, above it is another colour. You are standing on the exact line of it. Your feet are on the earth and your head is in the air. Roughly speaking you are a 90° vertical line. You are a definite addition to the landscape, that is you are holding down that piece of ground and you’re human.